So the question is, where would I go? 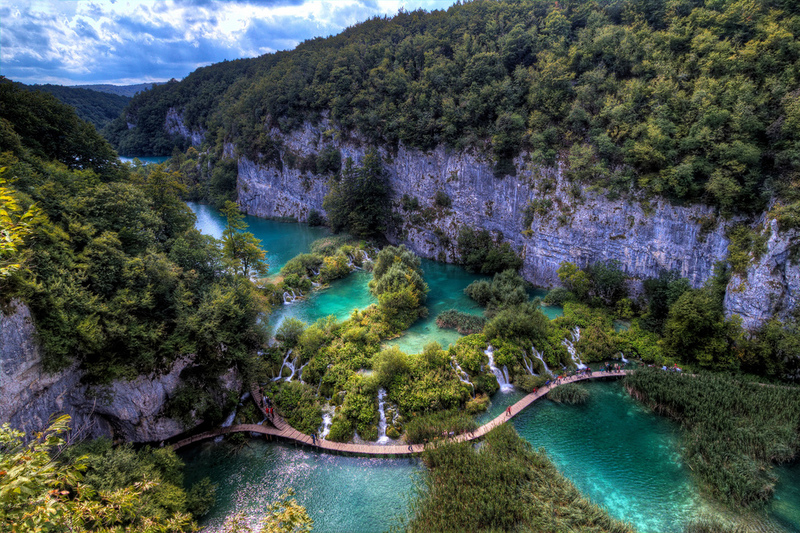 My answer is…Plitvice National Park, Croatia. Stunning, isn’t it? Those wooden walkways you can see arc over the surface of the stunning blue water, wind through the scenery of the gods, allowing visitors to soak in the waterfalls and surrounding mountainsides. But first, I’ve got a little reading to do. Please check out the Soul Cutter and The Ghosts of Aquinnah. This entry was posted in Uncategorized and tagged lexa cain julie flanders dream destination blog hop. Bookmark the permalink. I’m jealous. 🙂 I don’t know of a way to follow without adding to your list. You may be able to find suggestions online. Sorry I can’t be of more help. Thanks for commenting. I’d go to the historic ruins in a heartbeat, but afterwards… 🙂 The bloghop was fun. Lexa and Julie have great supporters. It definitely enticed me. The visit was my pleasure. Thanks for commenting! havent heard croatia yet! great choice! id love to take a swim in that lagoon/lake! Oh yes, stunning is certainly the right word! I keep forgetting how delightful a visit to Croatia could be, and then I see photos and am reminded. That makes me want to go even more. Thanks for commenting! Wow, that looks amazing. I’m enjoying my travels through this hop. I hope to see these sites for real one day. Croatia. Reminds me of Luca on ER. Looks beautiful. I hope you get a chance to visit. It looks like a gorgeous destination. A lot of people have been talking about Croatia lately, I may have to look into going. Your dream destination sounds perfect. I’d love to hike in that park! Me too. It’s so beautiful! That’s been my reaction to all of the pictures other participants posted. So many beautiful places. I never thought of Croatia. And it’s awesome, great choice! All these dream destinations have me thinking of many wonderful places I’d like to visit. I never heard of Plitvice National Park before, but it sure is lovely. It was just one of many amazing places I found to visit in Croatia, but it was the most beautiful. It looks like someone tore this picture straight out of a fantasy novel. Croatia looks like a fascinating and beautiful place. What a unique choice! I don’t think I had a picture in mind of Croatia. I certainly wouldn’t have imagined it looked so spectacular. Thanks for enlightening me. Thank you also for the follow. I’m happy to reciprocate (via email). Oh, how lovely! I visited Croatia when it was still Yugoslavia and it was profoundly beautiful. I’ve always wanted to go back. I’ve heard Croatia has some beautiful places to visit. I have an aunt who went there a few years back. There’s so many destinations and so little time. Wonderful picture! Definitely dream worthy. What a beautiful picture! Looks like something about of a dreamy fantasy novel. Wow! I’ve never even heard of this place but that picture is… my jaw dropped, let me put it that way. What a fantastic choice! And thank you, BTW, for connecting with me! This is amazing. I’ve never even heard of the place before. Now I want to go to Croatia as soon as possible. Oh my, stunning! There are so many beautiful places in the world, I hope we all get to go to our dream destinations one day. What an absolutely gorgeous looking park! I’ve heard that Croatia is beautiful, and now I know why. Wow! That is gorgeous, and I’m definitely adding it to my dream destination list! Very cool! Croatia is so interesting! I’d love to go there. Awesome choice! In the past, I’ve been a bit leery of the idea of visiting Croatia, due to the wartime crimes of the Ustashis, but I’ve realised that today’s Croatians are an innocent generation who had nothing to do with that. A long time ago I found a really awesome website for a Croatian animal rights group, which also helped to change my opinion. That’s great! The world continues to change, and so do people. What beautiful pictures! Croatia looks like a terrific choice. And a unique one, too. I don’t think anyone else has chosen it so far. Thanks! I was amazed when I realized how much there is to see in Croatia and such beauty. Apparently there are nine parks available to visit. Wonderful, huh? What a gorgeous photo! Looks lovely. I agree. Even before I knew about the variety of places to visit in Croatia, this picture drew me in. My pleasure, Lex! It is gorgeous, isn’t it? Wow, I’ve never heard of this park but it looks amazing!! What a stunning pic! Another place to add to my endless list of places I’d love to see. My pleasure, Julie! Congratulations on your release. Oooooo, yeah! I would love to swim and snorkel in that water. My husband would want to scuba dive. When are you going? Seriously! Why not? Croatia! Unique choice, but that park looks stunning.